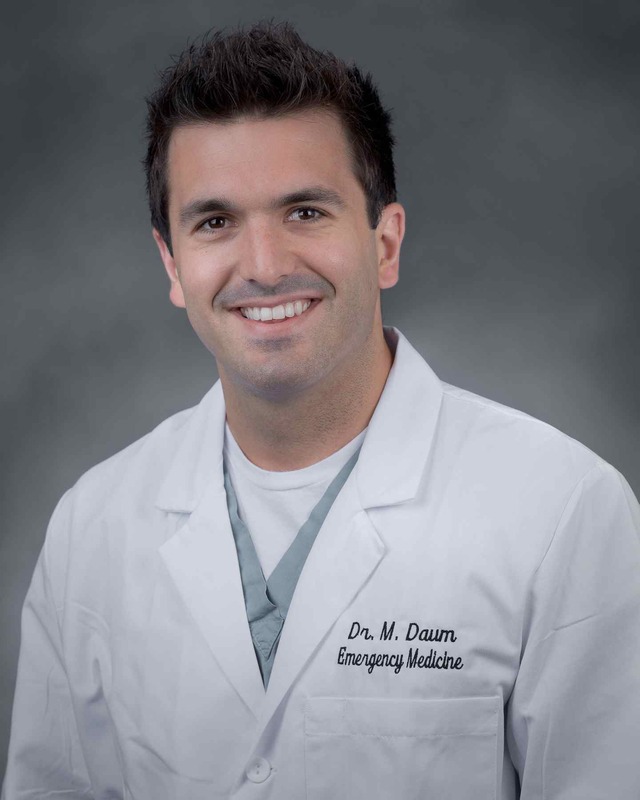 Dr. Daum is a graduate of Indiana University School of Medicine and a member of the Palmetto Health Emergency Medicine Residency, class of 2016. 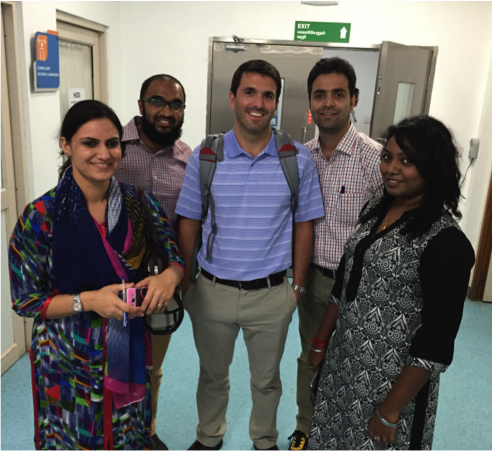 I had the wonderful privilege of visiting three different cities in India for a total of 16 days in July of my 3rd year of residency. I went by myself, not knowing anyone in India, and had an amazing time. A little background first. I came across this opportunity as a recommendation from Dr. Heather Brown, the director of Global Health at Palmetto Health EM Residency Program. She completed her International Medicine Fellowship at George Washington University (GWU), during which time she had opportunities to work in India. Her colleague is Dr. Kate Douglass, who is one of the Global Health faculty members at GWU. 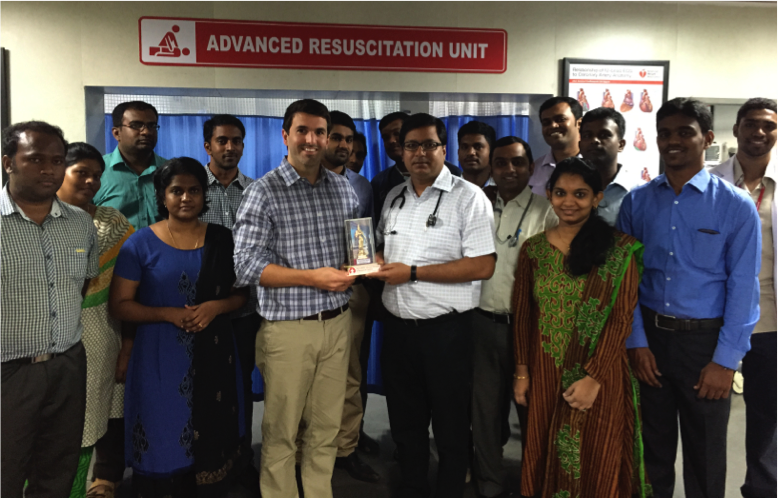 GWU is playing an integral role in helping jumpstart Emergency Medicine specific training in India, which up until 2011, was not recognized in India as an official specialty. GWU has established a three-year Masters in Emergency Medicine (MEM) program, which helps train physicians in acute medical and surgical emergencies. The visiting faculty from GWU and surrounding partnerships help provide lectures, seminars, simulations, and clinical teaching to the residents participating in the MEM program. Thus, I went as a visiting faculty, helping provide both lectures and clinical teaching. 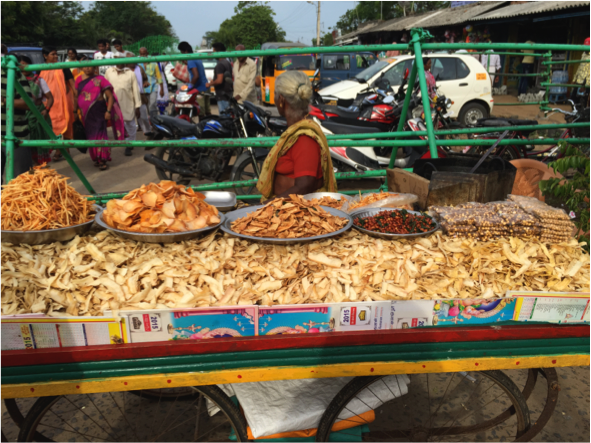 My original impression of India was wow - this country could not be any more different than what I am used to. Granted, I am just a small town boy from southern Indiana, where the only culture I grew up with was good ole fried chicken, hard working values instilled in me by my parents, and a 'Red, White, and Blue' point of view on the world. Needless to say, the majority of people from my small town do not get the opportunity to travel to India, and frankly, are not well versed in diversity and cultural understanding (I used to be one of them). However, I didn't just fall off the ol' turnip truck either. My medical training has given me the opportunity to visit poverty-stricken areas and witness different medical practices in Honduras, Guatemala, and most recently Haiti this year. But no matter where I have visited in the past, India was just different. Name anything. From the obvious... language, food, population density, climate, dress, and religion. To the not so obvious... Organization and cleanliness, body language, hospitality, hospitals, patient acuity, and where healthcare priority fits into government. 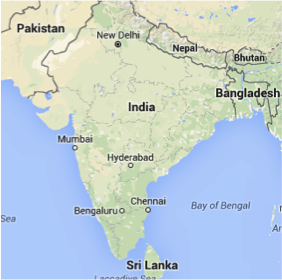 India is roughly 1/3 the size of the USA however has roughly 4x more people. It is home to 17.5% of the world's population. India has 53 cities with over a million people (USA has 10). 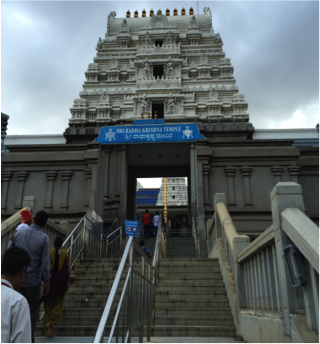 I went to three southern India cities, Bangalore-also called Bengaluru (pop. 8.5 million), Chennai (pop. 8.6 million), and Madurai (pop. 1.5 million). Each city I went to had its own character and intricacies. I have tried to go a little more in depth with each city below. Bangalore was the first city I visited on my trip. The hospital with which the MEM program partners is BGS Global Hospitals, one hospital within a large conglomerate. The program director was Dr. Samir Mohammad. I helped administer oral boards to 1st - 3rd year MEM residents the first two days there and lectured during the next two days. Fortunately, I had prepared six different 1-hour lectures prior to arrival, as well as many cases from my own experience in residency to use for case-based teaching. I needed them all, as the residents there (as in all three cities) were so enthusiastic about learning. It was very evident that they were very well-read, however, they were not up to date with the new, ever-changing knowledge and clinical practices in emergency medicine, as their knowledge is almost solely built on textbooks like Tintinalli and Rosen. I had not realized how much FOAM-Ed, Up-to-Date, and podcasts had shaped my education. 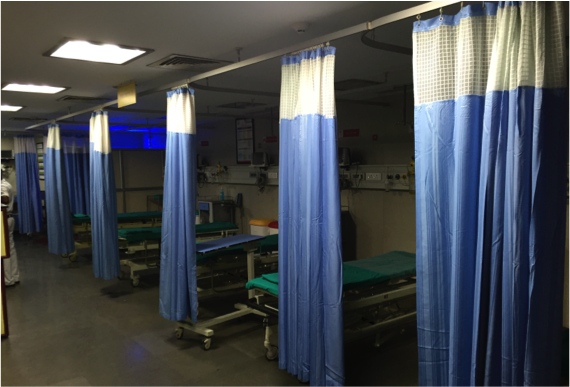 The ED had three "trauma bays" which also doubled as acute care rooms. 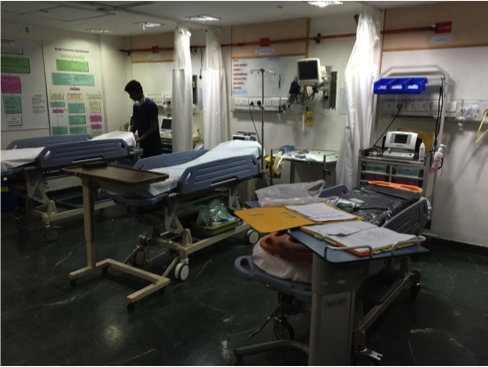 They had approximately 10 beds total, which is "large" compared to other hospitals in India. I also got my first exposure to Hinduism, as one of the residents took me through Sri Radha Krishna Temple and explained a lot about Hinduism and how religion plays such an important role in the daily lives of everyone in India. Of note, 79% of India practices Hinduism, 14% Islam, and 2% Christianity. And, as in all Hindu temples in India, it is mandatory to go barefoot (you remove your shoes and wash your feet prior to touring). I visited Chennai and the BGS Global Hospitals-Chennai second. The program director there was Dr. K.R. Rammohan. I spent four days here, lecturing the majority of the time, and doing bedside teaching during the remainder. As stated above, literally almost every patient I assisted with required intubation, cardioversion, or some other emergent necessity. I connected the most with the residents from Chennai. 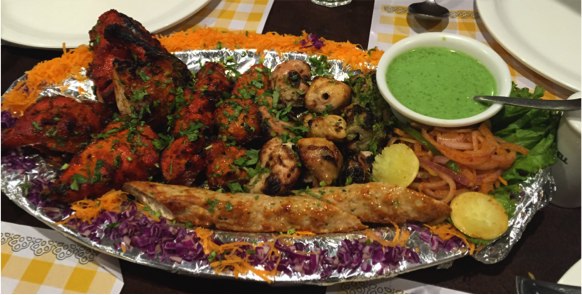 They taught me how to properly eat in India (with your right hand and no utensils, of course). They also taught me the seemingly hundreds of ways rice can be used. I had long, fascinating discussions with two Muslim EM residents regarding common misconceptions of Islam, and they took me to their mosque and showed me how they prayed. It was a very enlightening experience! I had no idea Christianity and Islam had so many common features. They also introduced me to their favorite Arabian foods (pictured). 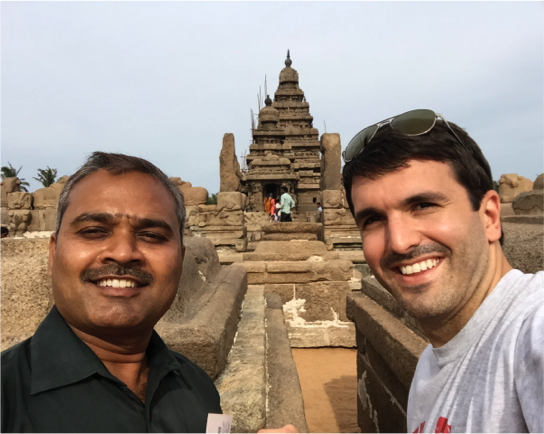 One of my most favorite experiences was when I rode on the back of a resident's motorcycle to a World Heritage site one hour south of Chennai called Mahabalipuram. It was quite exhilirating to ride through chaotic traffic with seemingly no traffic rules-I will discuss this more later. 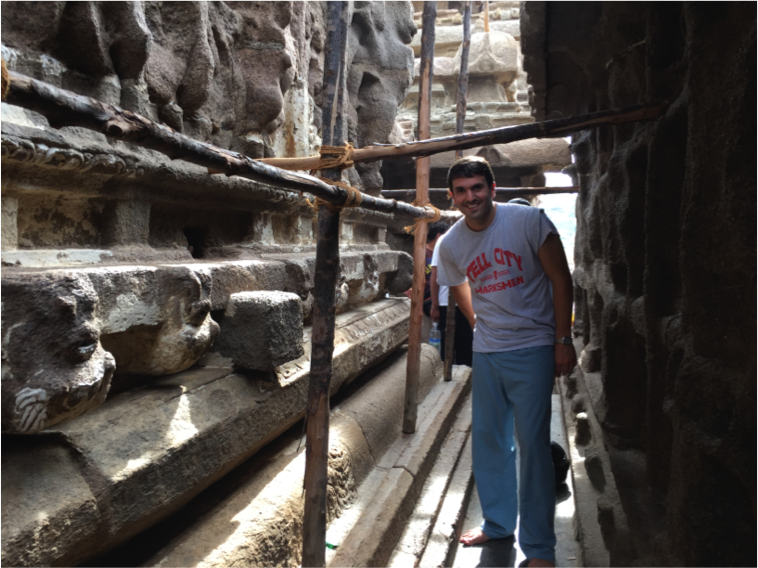 The monuments we visited were carved out of bedrock in 700 AD. Once again, I walked through them barefoot as they are sacred grounds. I also visited a beach while there, and I was amazed at the number of people present (hundreds), as well as by what they were wearing. Women were fully clothed and did not enter the water, while the men wore jeans and would play in the water. There were also opportunities to buy a horseback ride, as well as tons of other vendors, as evidenced in the picture. I flew to Madurai after Chennai. Madurai is a city in the state of Tamil Nadu in southern India. The hospital was called Meenakshi Mission Hospital and the program director there, Dr. Narendranath Jena, is quite famous for his pioneering role in emergency medicine in India. His welcome was warm-hearted and his excitement for teaching and passion for EM was contagious. 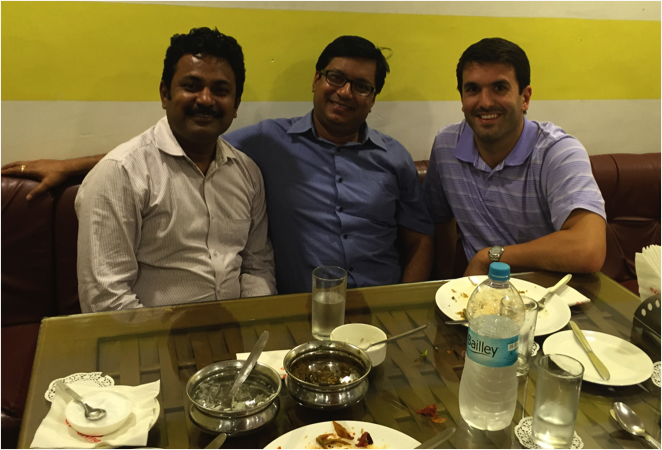 I ate dinner with Chennai's PD, Dr. Rammohan (left) and Dr. Narendranath (middle). The next morning, I came to Meenakshi hospital only to find Dr. Narendranath in tears as he was mourning the death of former Indian president Abdul Kalam (passed away on 7/27). They were close friends, and President Kalam actually performed the dedication of the ED at Meenakshi. There was a shrine to mourn his death in front of the hospital as well (middle of picture above). The entire country went into a state of mourning for several days. On the day of burial, all government offices and businesses were closed. The emergency department was the largest, nicest, and by far the most organized of the three cities, and it was evident that it was due to the diligent work of Dr. Narendranath. I lectured here for three days, and also took one day to dedicate to clinical skills such as intubation, central line placement, ATLS, and ACLS cases. 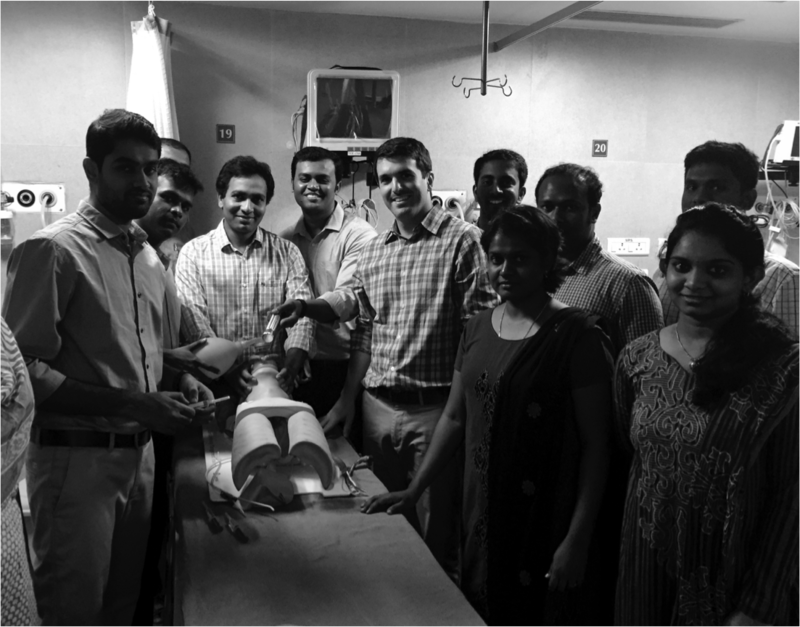 The residents here absolutely loved the one-on-one clinical teaching, especially using the dummies to intubate and do case reviews. In addition, I helped the residents intubate two patients within about an hour time span the last day as well. 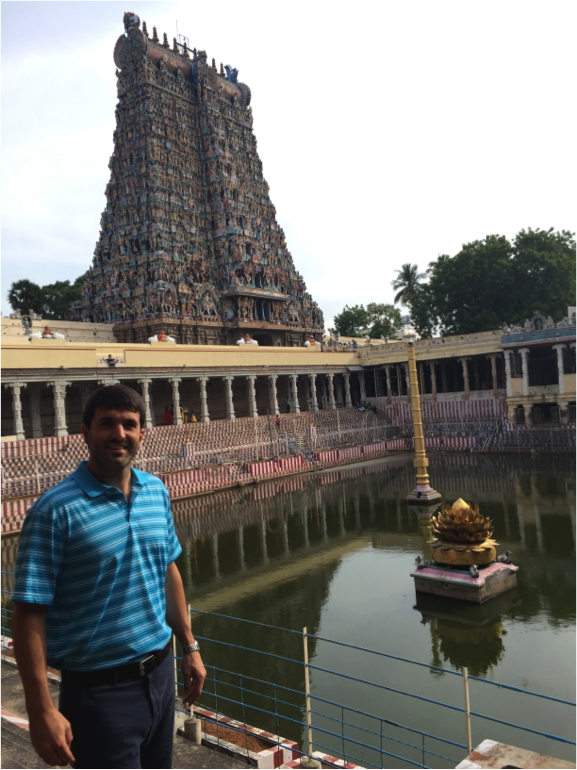 One of the residents took me to one of the largest Hindu temples in the world called Meenakshi Amman Temple, which forms the heart and lifeline of the 2,500 year-old holy city of Madurai. It is considered one of the "New Seven Wonders of the World" and was truly a sight to see. Again, barefoot. 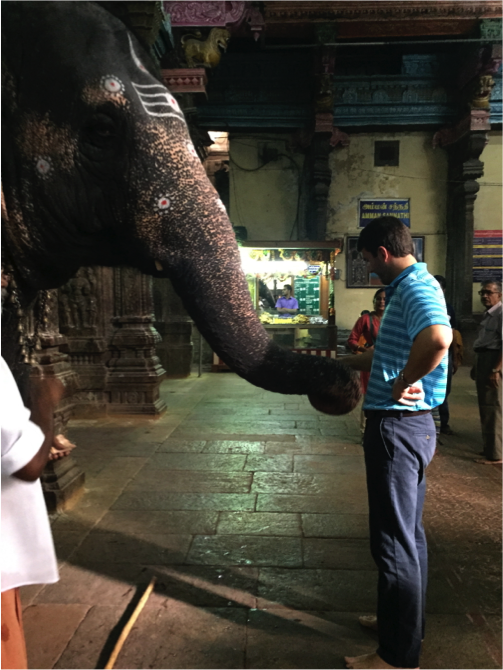 There are live elephants that walk through the temple because they are considered sacred creatures. I had one bless me when he tapped his trunk on my head. The very last day, Dr. Narendranath presented me with a very nice award for serving as visiting faculty. It was a token of his appreciation. But the pleasure was truly all mine. One common theme that persisted in each city and hospital I visited was the wonderful hospitality. I was greeted with such warmth and kindness by each EM program director, residents, and staff. The PDs in each hospital would constantly ask if there was anything they could do to make my stay and experience better. One PD even had the hotel chef prepare a different traditional south Indian dish every meal. Also, the respect that is given by each resident was amazing. They would all stand when I entered the room and would constantly say "yes sir" or "no sir," something I would never expect (not even when I am 65 and ready to retire), and something Americans often lack - respect for peers and elders. The acuity of patients presenting to the emergency departments at each of the three hospitals I visited were quite different than here in America. I know here at Palmetto, we generally see anywhere from 93,000-100,000 patients in our ED every year. We admit approximately 23% of our patients to the hospital. An even lower percentage gets admitted to the step-down unit, and even fewer get admitted to the ICU. 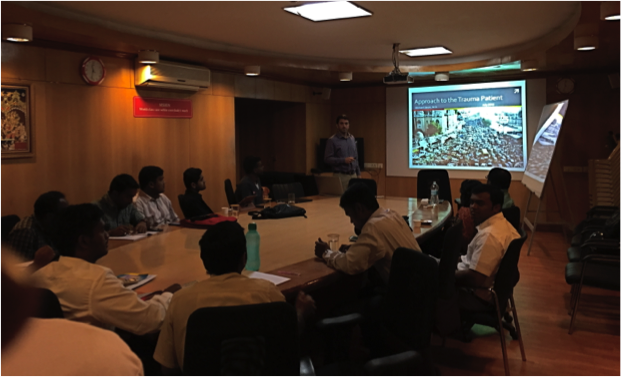 However, in Madurai at Meenakshi Mission Hospital, they see approximately 14,000 to 15,000 patients per year in the ED, of which they admit more than 50% to the ICU! These numbers were pretty similar at both BGS Global Hospitals in Bangalore and Chennai. Point being, the patients present with much higher acuity in India, mostly because they do not have great access to health care, but also because they oftentimes attempt to treat ailments with home remedy and prayer. The ambulances used were quite different as well. They are hardly equipped in comparison to our ambulances here in the United States and the EMS personnel basically act as taxi drivers - they are not nearly as trained or skilled in resuscitation as those whom we take for granted here. However, there is now a push toward educating EMS personnel in advanced resuscitative measures. I could not be more thankful for the opportunity to partake in such a wonderful experience. I know it could not have been possible without the partnership of the Palmetto EM Residency Program with the GWU International Medicine Program. Most notably, I would like to thank our program director, Dr. Thomas Cook, whose incessant mentioning and push for pursuance of global health, international travel, and its unbelievable life-impacting potential proved 100% true! Also, I would like to thank Dr. Heather Brown and Dr. Kate Douglass who helped make this all possible. I will never forget this great experience.